The 4 of Us: super 6! Sophie woke up today and found that I had decorated her room with a heart shaped banner for over her window. Downstairs, Dad offered her pancakes however she opted for her usual cereal. She was dressed up in her little Lands End skirt, leggings and top. She happily let me take her to daycare early so she could catch the van into school. At around 2:00pm, I popped down to the daycare to watch her cut into the cake Karen had made for her. 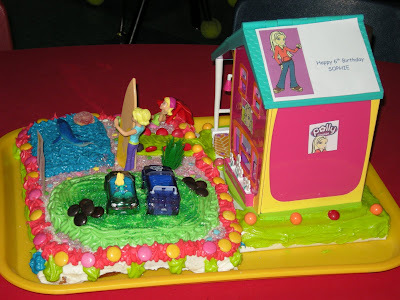 She did a great job of the Polly Pocket theme. After daycare we took Sophie and Fynn to dinner at Boston Pizza, her favourite place and she got to have a "special" drink, an orange slushie. Then she opened up her two gifts. She got her much anticipated Nintendo DS and THE most adorable little outfit for her American Girl doll. Vic and I went out for about 2 hours to a fundraiser and she had one of her favourite sitters over. She went to bed a very happy little 6 year old.